Extract from: Admiralty Handbook of Wireless Telegraphy, B.R.230 (Vol. II). HMSO London, 1938., Section W, 6. Luminous quartz resonators, invented by Giebe and Scheibe, have been in use in Germany for several years. These resonators are visual indicators of frequency and may be used to check the performance of calibrated circuits, or of a transmitter; they depend for their operation on the well-known piezo-electric properties of quartz crystals. A crystal is lightly held in a metal fitting which constitutes one of the electrodes in a gas discharge tube, the other electrode being a wire or small metal plate near the surface of the crystal. The usual gas filling is neon at about 3 to 5 mm. pressure. The metal fitting, holding the quartz, is constructed so that no part of it is as close to the other electrode as the surface of the quartz. With the electrodes connected appropriately to a resonant circuit, powerful oscillations will cause the neon to glow brightly with the usual insensitive glow discharge between the electrodes. If, however, the input is considerably reduced in strength, so that direct glow discharge between the electrodes cannot be produced, then a much fainter but very distinct glow appears on the surface of the quartz when its resonant frequency is applied. This characteristic glow is due to the field produced by the piezo-electric charge on the surface of the quartz, and the sensitivity of this visual indication of oscillations is about ±0.02%. It has been found convenient to mount the resonators in ordinary 4-pin valve bases, the electrodes carrying the quartz being connected, one to the grid pin and the other to the anode pin. The figure above shows three samples. 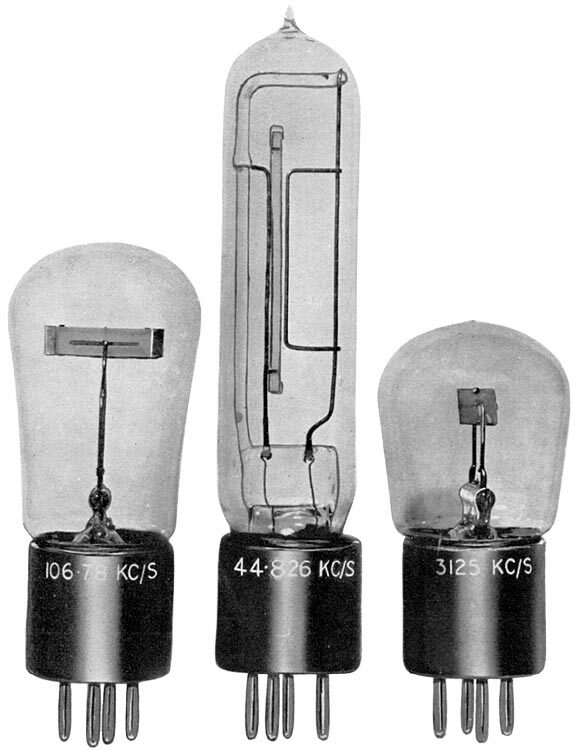 The short one, with a horizontally supported bar of quartz, is similar in general appearance to the original German models and is typical of resonators with frequencies of about 100 kc/s. The largest type was constructed for lower frequencies of 40-50 kc/s. The one with the square crystal slice is designed to work on a frequency of about 3,000 kc/s. Crown Copyright 1938 (Now public domain).